The first thing that an exchange student can use is pick up service. ESN members help incomers to get to the guest house where most of them have the accommodation for their stay. Every day at the beginning of the semester there are also city tours provided like the one I joined with dinner at Kiwi and Beer competition called Beer rally. Actually, during the first week before the school starts, there are plenty of events what are worth joining and there is only limited offer of tickets, so it's convenient to exploit the opportunity and buy ticket as soon as possible. For any exchange student I would also recommend to join them on Facebook. Who use Calendar on a device with connection to the internet, than should definitely add their Calendar not to forget any event. All of it happens EVERY semester, so no matter if you are coming for winter or summer one! As the webpage of ESN Maastricht stated, I send them an e-mail that I would like to join. I soon got an answer saying: „The tour will start at 17.30 from Vrijthof and will end at 19.30 at the Kiwi where you can join us for a dinner at Kiwi before we leave for a pub called the Highlander where we will participate in a typical Dutch activity; a Beer Rally!“ Nice. I wrote to my friend Bára, but she decided to go the next day, but Shona decided to join albeit she is a regular master student. The meeting point was at McDonald at Vrijthof, which is easy to find. We were split into 2 groups of about 15 people and made a small tour visiting some places where we can get a discount and to see the city a bit. First we went to Mac – Maastricht Athletic Club. We got a free fruit drink and information about the facility. By obtaining the club card, you can go to any session provided by the Mac, that's fair for the price. Ok, the building and equipment is new and looks awesome. We continued to the Market and then visited a small harbour on the north with some restaurants and then we went along the river back to the city centre. We could not miss the bar-street Platierstraat and end up at David Coctail bar located at Achter het vleeshuis 27. We can get a discount with the ESN card and also every tuesday and wednesday the 2nd cocktail is 50% discount for everyone. We got a free shot of something special and continued to Kiwi for dinner where we met the second group. The city tour was not like usual guided tour with a lot of talking about the buildings and places you can see, on the other hand was our guide nice to talk to about student life in general. 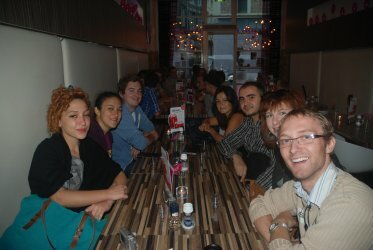 Kiwi is a restaurant located at Ezelmarkt 15 just next to the Student service centre. You can get a small bite for a reasonable price and when you show your ESN-card you will get the first drink for free! This place is famous for their hamburgers. For big eaters there is a burger called the Burgermeister containing 600 gr. of meat . Feeling hungry? Nobody of us ordered this biggie. You also can get a pizza or noodles with meat. That was my choice and also a few other's choice – noodles with salmon. It was a small portion according to what I am used to eat, but it was good. We sat at the table with French students – some from the SBE but also from the Law faculty. They were master students in France but their university advised them to enrol for bachelor courses as the master ones would be too difficult. WTF? I could not believe my ears but they were not kidding. I was also surprised by the amount of the Erasmus scholarship as living expenses in France are not that much lower than in Netherlands. Well, this only confirmed my opinion, that the Erasmus programme has its mistakes that nobody is trying to solve. After the INKOM week I got used to the high level of English spoken among them, but situation was different when speaking with exchange students. Well, they also speak their own language with each other (especially French and Spanish) even in the case of being in group with other students who do not understand it. 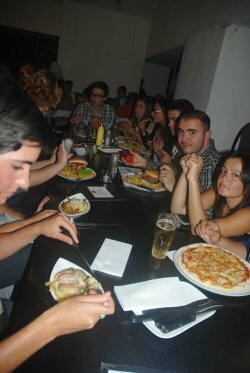 After the dinner we moved to student bar called Highlander. 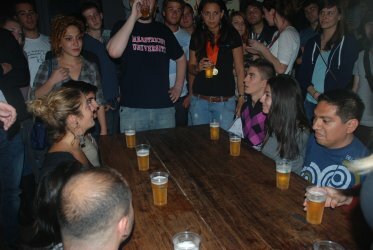 When we got there, I understood why it's called student bar. Price level in pubs in Maastricht is quite high and the amount of the drink you get is small. Highlander is the cheapest bar in Maastricht I saw so far. But it's a small place and it got crowded very quickly. Everything has its pros and cons. We (me and Shona) met there Zhi our friend from INKOM and ordered special cherry beer. I know that this sounds crazy as I am from the Czech Republic, country of the best beer ever, but I just had to try it. Well, I didn't order a second glass I am glad that I tried it, the taste was not bad, but only for a few sips. It's only a week after tasting several sorts of beer that are available here in Maastricht, I must say that I prefer house party with beer from the supermarket. Beer from barrel is more fresh and has better taste, but what local bars offer is mostly water called Heineken. It has no foam, no taste and bartender has kind of a plastic knife for throwing out foam that is over the glass. But back to the beer rallies. You form a group of four people and the target is to drink sequentiality small 0,2l beer faster than the other team. Teams compete and the fastest one wins. Of course there were more teams so the whole tournament takes a few hours. It's a way how to get drunk pretty fast I would say. I was tired, without a bike, so I had to walk home. Therefore I left at 11p.m. without seeing who the winner was. But it was fun to watch it I decided to check the other events provided by the ESN office and join some in the following week. Article last edited 17. 1. 2012, viewed: 825-times.